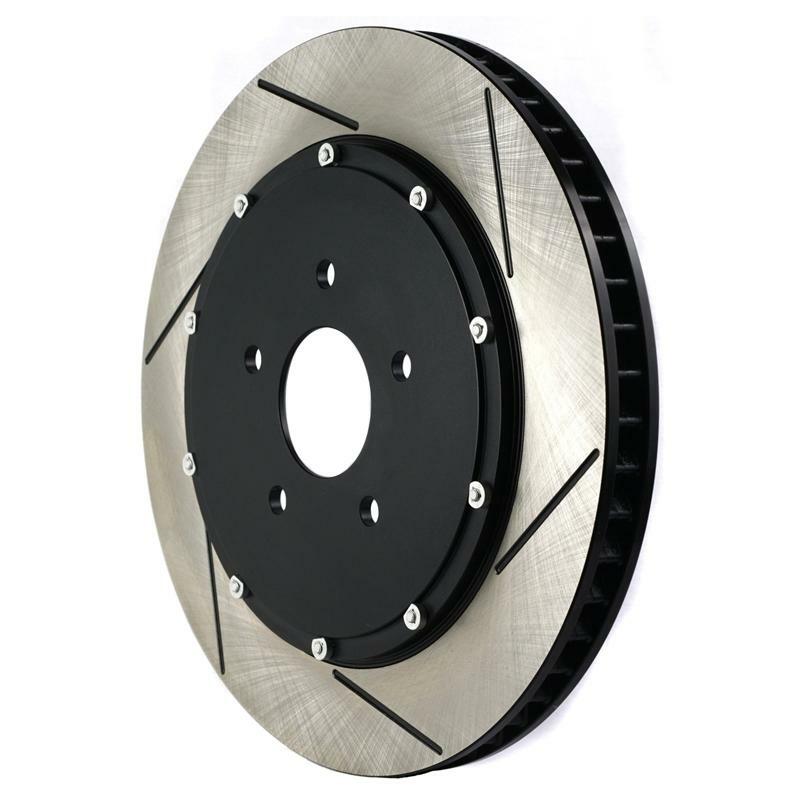 Racing Brake Two-Piece Rotor - Dezod Motorsports Inc - Home of the automotive performance enthusiast since 2002. Lighter rotor (12-16% weight reduction varied with the size and design) than original one-piece rotor – meaning lower spinning weight. 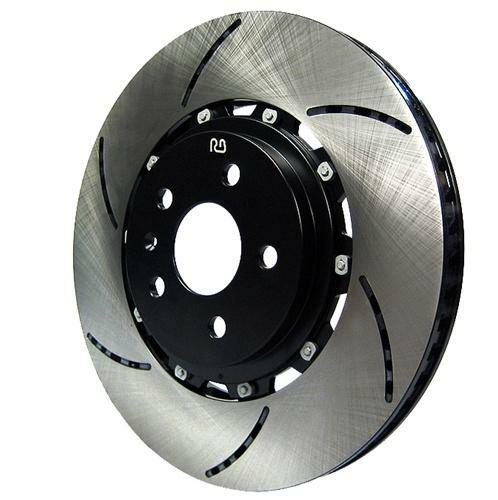 Solid disc (non ventilated)– Mainly for light duty usage such as rear rotors or drag racing. Straight vane (non directional) – For medium duty (usually up to 12”). Curved vane (directional) – For heavy duty (from about 12” up to 15”). Convergent vane (uni-directional)– Our patented design disc is lighter but stronger and more efficient in air circulation than conventional curved vane designs. Air ventilation is not very efficient because it admits air only from one side (inboard). Stress load is unbalanced as load center is on the outboard friction surface. Heat load to hat is solely from outboard disc surface and is unbalanced. Heat transfer is directly from outer disc surface to rotor hat which heats up rotor hat more rapidly. Convergent vane allows greater airflow than conventional curved vane. More efficient air ventilation – Center mount provides air inlets from both inboard and outboard sides. Heat load on rotor hat is balanced from both sides of friction surfaces. Heat transfer from disc surface to rotor hat is greatly reduced due to longer distance to travel. Stress load is balanced due to the mounting surface being at the center plane of the disc. The hat can be mounted to disc on either side without having to identify left or right sides, yet once mounted, the rotor is truly directional! This avoids mix-up in installation and allows for easier inventory of parts. Fixed two-piece rotors do not allow for contraction or expansion of the disc during heat cycles. - Standard nuts and bolts. Many suppliers offer this type of assembly. Although these two piece rotors are lighter than standard one piece rotors, but they do not have the functions of sliding two-piece assemblies. Fixed assemblies are easier and less expensive to make because they do not require the same precision as sliding type assemblies. Disc has oblong holes which allow the disc to move (expansion & contraction) during heat cycles. - Bolt to sleeve nut with conical washer, lock-tite is used (washers usually flatten out and create rattling noises). - Bolt to “self-locking” sleeve nut w/o having to use lock-tite providing positive fastening without the rattling noise (RacingBrake design). Rotor Ring: Casting with our own tooling from high alloyed iron with proprietary heat treatment is our best assurance for lasting performance in racing industries. Rotor Hat: Forged 6061-T6 aluminum alloy with our own tooling for better strength and rigidity than billet (extruded), used by others. Disc is fully machined (including mounting tabs) and dynamically balance to <5gm-cm. Disc – EDP (Electro-Deposition Paint) see detail description, disc friction surface receives final double cross grinding to assure high precision in parallelism and thickness variation. Easy to break in. Rotor hat is coated with EDP to protect the aluminum surface from oxidation.